February » 2011 » Harrumph! Yesterday was our first overtly dangerous trip on NY’s Taconic Parkway. From my teens, I have tooled up and down between NJ or NYC and more recently from Boston to and from New England and Canada. It’s always slower than an Interstate, rife with rolling hills, low traffic, scenic and free. Friday though, it was a setting worthy of a 50’s movie, wherein the hero and heroine confront nature and out-of-control situations. Thursday, we were on 90 West from Boston and up to Amherst, then back to 90 and down 50 miles on the Taconic. Headed to Poke (Poughkeepsie), we passed the real points of interest on the Western pike — the Ty-D-Bowl blue ice formations on the road cuts, colored by minerals in the rock. Then just over into NY, we turned South on the Taconic. As though they were declaring truth in advertising, several deer families were by the watch-for-deer signs, only 10 or 20 feet off the road. The occasional still-golden willows were undulating delights. Locals have direct access to the road, giving us amusement at some of the green signs — BULLS HEAD ROAD, NINE PARTNERS ROAD, NEXT ROAD, and RIGOR ROAD. The parkway’s visual surprises more than paid us back for dropping into the 50MPH world. Overnight though, the rain came quick and stayed hard. It shifted into sleet, teasing us with a half hour of snow, but returning to freezing rain. The tour guide at the CIA repeated, “Watch your step!,” “Hold the rail!,” and “It’s slippery here.” By the time we headed back on 44 from Poke toward the Taconic, we were in driver-training horror. We saw a heavy panel truck that had simply skidded off 44 into two feet of roadside snow and ice head first. A trooper was headed — slowly, cautiously, with lights — to the rescue as we passed. I drove down, the longer day given the side trip, but dry and safe. My wife insisted on sharing the duties and taking the wheel back. Haar. The Taconic was slippery at best. We saw a Suburu that waddled all over a lane, while going maybe 15MPH. We passed several guard rails with obvious impacts in the packed snow. Clearly at each indent, a driver had lost control but was able to back out and proceed. The parkway was iced over with that sleet and 30 seemed the maximum safe speed. Then coming down those formerly pleasant rolling hills, our van seemed to hydroplane on the ice. She shifted into a numbered gear on the automatic and slowed. Not everyone was so cautious and at several points we saw the effects. At one, a Suburu SUV had taken off nearly half a Toyota’s rear bumper. The car had its hazards on and took the right lane, immobilized with hanging parts, while the SUV had pulled off ahead. At another point, three cars had collided. It seemed no one was injured, but the local firefighters used flares and were stopping cars to insist they drive at 5MPH maximum. The three cars with their drivers and passengers were all stuck, two embedded into guard-rails on the left and one off its wheel on top of a snow/ice mount on the right shoulder. Occasionally, some fool would tool by at 60MPH, sliding past the rest of us. We could see their vehicles wobbling and fishtailing. We did not see them in piles farther ahead, so they either managed the trip or disappeared off the road entirely. At the top of the Taconic is Route 90, which becomes the Mass Pike a short distance East. It was plowed and fairly passable, except for occasional patches of 100 yards or so. In MA, the sleet became rain, which in contrast to the previous 90 minutes seemed very safe indeed, messy and requiring wipers and regular washer squirts, but 65MPH worked. We didn’t see any deer on the way back. They surely had more sense than the drivers and waited out the storm. Chi thuds and thumps in the dark as the restless captain did. She brings with her alert-making caution. Be it known that her back end does not work well. Some genetic neurological disorder makes walking into loosely controlled swaying. It’s as though her rear legs weren’t getting the executive messages in time. Even with her every-other-day steroids, she is free of pain but not of clumsiness. Thus in the dark, when she is ready she thuds four flights of wooden stairs up two high stages of the old house. She gives long, distant warning, but not with meows or cries. Instead, it is the slow thump, thump, thud, thud. Then we are in anticipation. Jumping up on our high bed requires deliberation nightly. She almost always goes to my side (yet why, as she’s not my cat and doesn’t come to me for affection and I am farthest from the door?). I can’t hear her on the carpet but know she is sitting and considering before committing. By then, I have made sure to clear landing room. Numerous times, she has found my arm or leg as a good climbing hold for ten claws. The suddenness of the stabbing leaves memories that amplify the dread beyond the relative low pain and small amount of bleeding. When she leaps up, it signals the preparation for the rest of the night, the announcement that the three of us can sleep. She’ll tend to take a minute, sometimes two, to find the best spot. That is often between my ankles or between our sets of feet. My sister lives way out in coyote lands of Northern New Mexico. She gets different night noises, and claims when she is asleep, she’s gone for the duration. Here, night comes on big cats feet and decides when we can sleep. 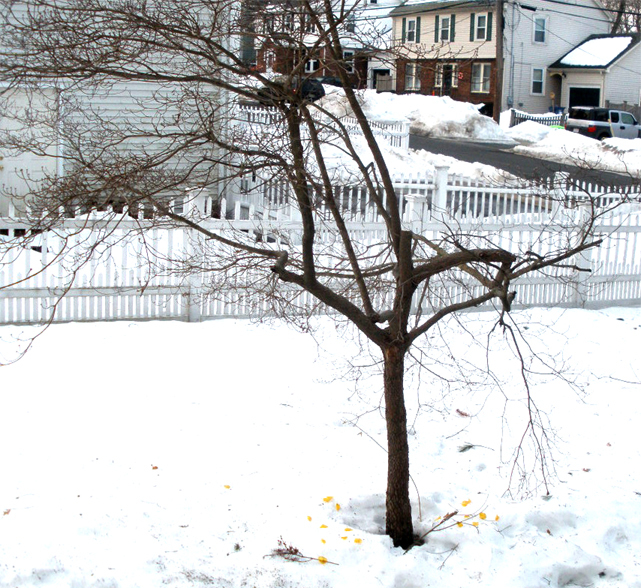 Scattering rose petals around the base of the storm abused dogwood in the front yard will surely do nothing for the tree’s health. Yet, we are in low-level mourning. 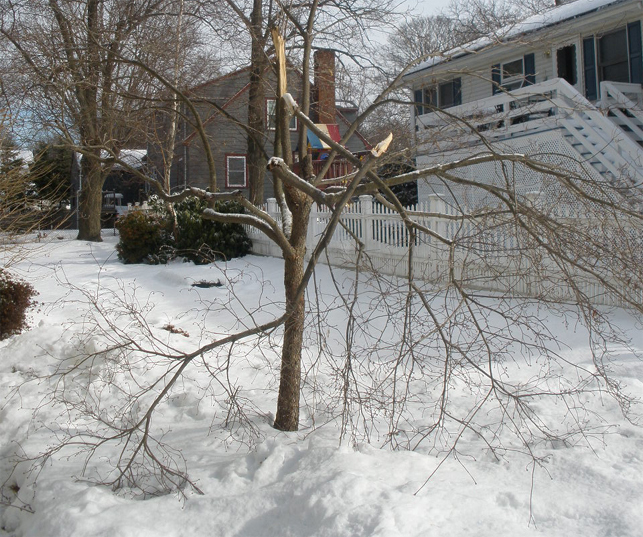 On the first heavy snow in our series of blizzards and nor’easters, this one lost all substantial limbs on one side overnight. By the time I went out to look for newspapers never delivered due to the weather, and to shake the icy and snow off, two limbs were separated and a third twisted like a kid does to a Popsicle stick. In a silly flair, we act a little like Andy Goldsworthy. Inspired by his documentary Rivers and Tides, certainly like thousands of others, we scatter flowers, stack rocks and otherwise make small naturalistic and temporary art. 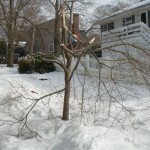 In this case, it is one way of feeling a little better about the damaged dogwood. The sad front dogwood half destroyed overnight in the first heavy snow. After two limbs cut, it still needs the third on the same side removed. That one is open and twisted. 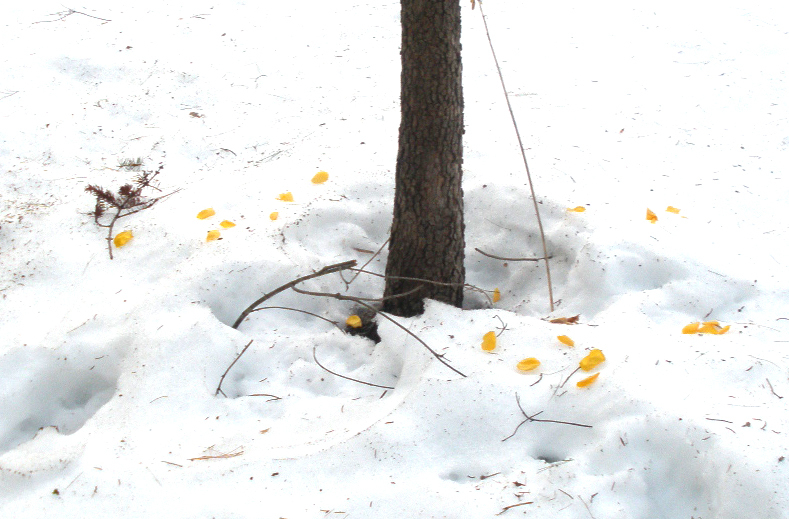 In a nod to Andy Goldsworthy, yellow rose petals offer scant solice. Oddly, the much older, taller dogwood in the back had the same weight but lost no limbs. They have the same soil acidity and other conditions as well as experienced the same storms. The limbs on the larger one are in general bout the same diameter as well. We assume that the younger, smaller one is not as healthy and may benefit from weep-line fertilizer. As I come to terms with the negatively transformed tree, I do switch to the pruning I learned in my master-gardener classes. 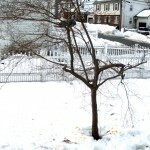 Unfortunately, there is no alternative in an effort to keep the tree than removing nearly all limbs on its south side. There will be something reminiscent of the thousands year old bristle pines or a bonsai that came in the classic way from a crypt roof. 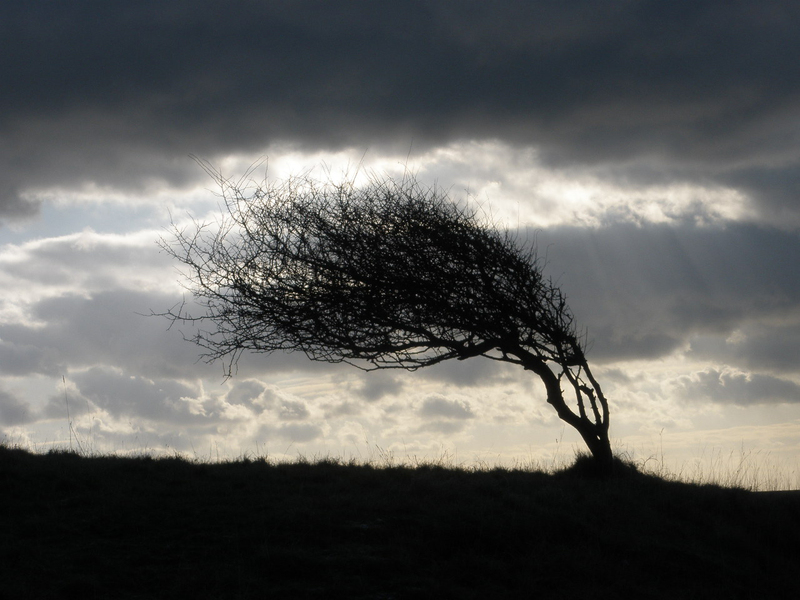 The trees tortured by winds (as here on moors by the English Channel) have their own ghastly elegance. I have scant hopes that this will display as well. I confess that it is animistic of me, feeling for an injured tree. Many other gardeners I have known are eager to rip out the injured, for the opportunity to bring in a newer, prettier specimen. That seems like someone trading in spouses to me. We’ll give our brown and green-to-be flowering friend what attention we can. Perhaps it will have the beauty of asymmetry. I didn’t see my shadow on the road. 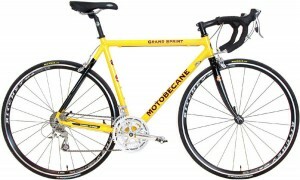 Maybe like Punxsutawney Phil I can be Bike Mike and predict a pending Spring. Back in the saddle after hiding from the road ice was like coming home again. Yes, I believe you can go home. At the Y, Barry and I have been sheepishly admitting to each other that we were off two wheels during and after our relentless bounty of winter. He said he was buying T passes for the first time in many years. I can pretend that my thin-wheel bike gave me more excuse than his fat-tire one, but we were pretty much the same. With harrowing, narrowing streets and roads, and drivers inattentive as their washer fluid worked, we were wary of riding onto a patch of ice and going down into or under a bus, truck or other motorized thingummy. Today the relatively warmth and brightness seemed to have many in Spring spirits as well. A couple of toddlers in different neighborhoods called out to their indifferent moms, “Bike…bike!” Hey, it’s an image and word they know and likely an aspiration. Bookend idiots on River Street at and just beyond Webster reminded me to still be careful, that frozen patches were not the only dangers. A self-entitled bozo in an F-250 floored it and cut right in front of me in a left turn onto Webster, but I was paying attention and braked and turned so he didn’t get me. Then almost immediately beyond the intersection, and old fool suddenly left her parking place, swinging her sedan sideways in front of me. Here, only my quick reactions and pretty new brake pads kept me from hitting the side of the car, stopping maybe two inches from the driver door, as she blocked the full lane and half the other one. My face under two feet from her closed window, but I kept my temper and just said loudly, “That was so illegal.” Rather than apologize or even acknowledge her recklessness, she looked solidly into her steering wheel and after 10 or so seconds finished her U turn. She looked really old and I bet doesn’t have much peripheral vision. If that’s the case, one would think she’d compensate a bit by looking where she intends to go. Meh. The rest was pretty nice, headed over to the heart of South Boston to meet a friend for lunch. On Blue Hill Avenue, I got a shout out from a man on a bike. “This is the only way to travel!,” he proclaimed, grinning widely. Down on Columbia, a limo cut across three lanes of traffic to turn onto a side street. I had the right of way, but more out of self-preservation than graciousness, stopped short to let his pass. In contrast to the River Street demons, he gave me a big smile and thank-you wave. We can share the road. Maybe the pending melting will help biking a bit soon. Many of the alleged bike lanes on American Legion, Columbia and elsewhere are blocked by SUVs and cars. The curbs are still squalid-ice covered and parkers would have to rub right against the mounds to leave the lanes open. They don’t even try, so cyclists (I didn’t see others beyond the nice elderly man on Blue Hill) were into the travel lane. Way back when I learned to drive on the mountain roads of West Virginia, motoring could bring some real pleasure. Sliding a stick-shift car around curves where 25MPH means just that was a oneness-with-the-machine feeling. I can’t really say that about chugging along from Hyde Park to Davis Square in a car. Biking though is often pleasurable. Physically that makes sense, but emotionally too, there’s a feeling of being in charge instead of at the mercy of everyone else on my road; what are all these cars doing on my road? I didn’t even mind the final push up Fairmount Hill at the end. Let the season begin. Something New Yorkers and Bostonians share is a dread of dirty-smellies, particularly on the subways. I got a chuckle a few days ago from a variation on that theme. I slid over undulating sheets of iced waves that should have been sidewalks to Mattapan Square. It seems Milton has three very strict snow-emergency rules — Chapter 6, Section 10 forbids sliding or coasting on a public way without a permit from Selectmen or the Chief of Police, Section 13 bans throwing snowballs, again on any public way, and Section 3 reads you can’t move any snow from your property into a public way. The bylaws don’t bother with the silliness of clearing your sidewalks of ice and snow. Harrumph, surely anyone foolish enough to walk in winter deserves the worst. From there, the Mattapan high-speed rail, a.k.a. the trolley, is frequent and quick to Ashmont. Ah, there where the subway begins, the vicissitudes of urban transit are in charge of your body and timing. The trains arrive when they arrive and leave when they leave. Moreover, many passengers are in for the long haul. They are likely to be headed to Downtown Crossing and many to Harvard, Davis and Alewife. This inspires you to look carefully as you enter a car. You likely know which end of the train you’ll want to be on for the right exit strategy. You’ll almost certainly have your choice of seats at Ashmont. You’ll really want to be careful about your proximity to cellphone yammerers and screamers, those dirty-smellies, and the obviously demented. You might be elbow to elbow for 20 to 40 minutes. On my last right north, I smelled him from 12 or more feet away. To my amusement, it was not the scent I might have feared. I checked him out. He was deep into his tin and not noticing me or anyone. He had on old clothes, but they were clearly clean and well taken care of. I could surmise that he was not homeless, but not quite all the way in the present. Perhaps he lived in a group home. What he was noticing and into, and what permeated half the car, was the curiously strong Altoids scent. It was the red-trimmed peppermint variety. The oils filled the air between us, aggressively and agreeably. He carefully and with apparent pleasure plucked three or four at a time to place into his mouth. 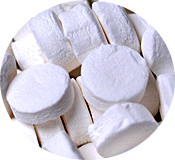 There was a man who enjoyed his mints. He rolled back when they were in his mouth and grinned his satisfaction. If there was a wee lesson there, it would be to go with what is before you and be aware of it. I might well have seen a not-quite-together fellow and ignored him or worse thought ill of him. Instead even my low level of awareness let in the pungency of his mints and a glimmer of his pleasure in them. Today’s newspaper ads tease with the chance to WIN FREE FOOTLONGS™ FOR LIFE. The literalist in me careered from whose life to sub per week or day to what’s it worth to is there a golden ticket you carry with you? Click on the company site to get the truth and wisdom. They figure that’s worth $384 per recipient. That would be roughly a small bag of chips per day per winner. The assumptions and math are harder for the big one. There is an ominous tone to the SUBS FOR LIFE, for two winners. In a melodrama, the company might be foundering under the financial commitments of many cycles of such prizes and then turn to offing the winners to stay in business. There’s nothing so nefarious possible here. In fact behind the many lines explaining the prize is the notice that you’d get a check for $27,780. With that, you could buy a car or go to high-end restaurants instead for quite awhile. That is, after you pay the taxes, for which you’d be liable. Let’s assume though that you really like subs, Subways subs, and want to spend all the bounty on those. To get a feel for the possibilities, let’s disregard taxes for the rough calculations. Subway figures your lifetime sandwiches for your being 36 years old and living another 44 years. To make it to 80, you’d likely have to work out and order with an eye to their nutritional information and low-fat versions. As you’d already have their cash, there’s no suggestion they’ll extend your winnings if you outlive the actuarial basis or ask your estate for the remainder if you win when you’re 54 and die 11 years later. They figure you got 44 years of stuffed bread. So what does a company that makes its living off subs think is a year/month/week of sandwiches? Well, using their retail value of $27,780 and dividing by 44, the pre-tax sum would be $631.36 a year. They do sell the $5 Footlong from time to time, but the more typical price is about $6. So that is about 100 units or roughly two a week. I am not a sub lover. However, were I, one every three to four days seems an insult to their menu. There are a lot of choices and other than the inherent sameness of lots of bland bread, you needn’t get jaded…assuming the company will be in business four more decades. There is no real downside here, unless you’re squeamish about some sandwich company projecting how long you’ll live. Perhaps channeling a prissy boxer, Jack Roach stabbed and jabbed furiously with his index fingers poking out of chubby fists. With an IBM Selectric typewriter (this was before PCs), he could hit 30, maybe 40, words per minute. Although he was editor of Management Review, the American Management Association’s monthly maggy and he had reported for United Press for a long time before, he had a block about touch typing. He said he could do just as well with two fingers. After being his number two for a bit, I figured that style matched his mental text creation speed. All was well, although text by poke is often loud. He came to mind as I begin to us an iPad. It’s virtual keyboards are touch-typing hostile. I snicker as I found myself flitting over the device with two index fingers. The design behind the iPad is typically Apple sophisticated. As much of the work as possible is behind the scenes, requiring expensive hardware and software to work, but easier for the user. You can turn the iPad any of the four planar directions, the screen rotates to match. Then, when you open an app and touch a field that can take text or numbers, ta da!, an appropriate keypad appears at the bottom of the screen. Applehead warning: If you are a true believer, leave now. candor follows. To a touch typist, these keypads come with two major problems. The first is obvious and common across several technologies, like netbooks and Blackberries, the keys are small. Even without the second issue, they’d be damned hard to use with adult fingers. Insurmountable though is that the iPad pressure is binary — on or off. There is no pressure adjustment. Try to rest your fingers on the virtual keys and you are entering characters left, right, top and bottom. Unlike many aspects of their products that Apple marketing would have us believe, this is not a keen feature, not a better way of doing things. While flexible from a software perspective, this is a throttle. I note that for my many years of computer and trade press, I had been exposed to or reviewed various versions of touch screens used in design or in factories and warehouses. Some were made for high sensitivity, but most were hardened for rough environments and big fingers. Then in the workstation and PC world came membrane keyboards, many with software adjustments for pressure and sound (the typewriter like click). The iPad ignores all that silliness and history. What it does instead is pretty much a per-app QWERTY, with variations such as the .com key that appears when you load up the Safari browser. What you get is very useful. Of course, that comes with the Apple attitude —Take what you get, love it, and don’t ask to know how it works or expect to alter it. So, there you have it, or in this case, I have it. I first saw and held an iPad in April last year. The day after its release, several members of the Boston Media Makers showed them off. They had waited overnight or from pre-dawn to get theirs. They then apparently spent all their time until the meeting playing with their very own so they could provide prima facie commentary. The BMM are largely Mac users…and iPhone owners…and iPod listeners. They love nothing more than telling someone he wouldn’t have this or that problem if only he has a Mac Pro instead of a PC. Yet, they each and all quickly commented on the iPad virtual keyboards. Their conclusion in general was you could create a blog post or do some writing with an iPad, but you wouldn’t want to. I of course had to try. I’ve posted on three blogs with an iPad. Yet, it is more work. You really can’t keep up with your brain hunting and pecking. The screen real estate makes it harder to see what you’re doing. Mostly though, the two-fingered typing gets tedious quickly. Nonetheless, I do surf with it. Its Safari browser is nowhere near as full featured or even as fast as Chrome on a PC, but it’s fine. I do enter short blog posts with the iPad. I also have added a quarter screen of apps, some of which are cloud ones, so I can share text or other files or whole apps from different platforms. I am not inclined to spent $50 to $100 for a wireless keyboard or docking station with one built in to essentially create a netbook with iPad works. I have a laptop and a couple of desktops. If I wanted the add-ons to make the iPad into an impostor, I’d likely just spend much less and get a netbook. Regardless, the iPad is fun and adequate to its tasks. It is also seriously light and portable. The keyboard limitations hark back to when workstation and PC users used to refer to the Apple products as MacinToys. That was unfair then, as so many graphics folk proved with their understandable loyalty to systems that served their needs better than the Intel-based world could. When I use the iPad, my index fingers fly. Sometimes, I’ll think of Jack. He managed an entire successful career as writer and editor just using two fingers. Worse things could happen. The longer they live, the more likely men are to cry or at least tear up in response to emotional stimulus. 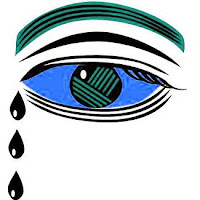 Perhaps the deepest effect of John Boehner as Speaker of the U.S. House may be awareness of adult crying. We are still in the puerile ridicule stage, but more is in the works. Already, there’s lots of pop and academic chatter. Two months ago, the NY Times got into it and today the Boston Globe did a light variation. Before and between, the MSM and net is rife with commentary. I suspect the interest is really more of a boomer issue than for other age groups. The older folk are still in a weird, repressed cultural hole and the young folk, at this point at least, don’t care…yet. For those of us not of my generation — and for those not particularly introspective —boomers felt lots of old-fashioned pressures. Our parents (and grands) as well as the movies and TV that we lived by and from, were of heroes and villains. We swam in Westerns and WWII movies in addition to more frivolous and fantastic fare. Our parents as a group were deep into cultivating the mythology of themselves as what has become known as the Greatest Generation, partially through history and more through that fluff piece. We didn’t question their courage, their world-changing post-war decisions, or much of any of their vainglory. As much as the white hats or helmeted GIs on the screen, the entire bunch were God’s gifts to us and the world. A key aspect of the real people and screen folk was assumptions of manhood…including that real men did not cry. Our movie men bit leather belts or bullets or took a swig of whiskey to have a leg cut off or a bullet dug out. Manly men could grunt or curse (mild exclamations at high volume only), but tears were for weak women or little girls. Given the culture, at least for the white middle class, women were the primary enforcers of such inanity. As constantly available surrogates for the working dads, they taught day to day how a boy was supposed to behave to be an acceptable man. Look no farther to figure out where the bullies, repressed men and wife abusers learned their stuff. Yet, it was the whole culture that constructed and reinforced this rigid role. 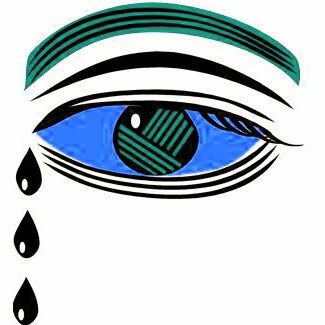 I recall from pre-elementary school how a crying boy was ridiculed by peers, parents, teachers, strangers. Men don’t cry. Yet, men in their 50s and beyond do. Their daughters’ weddings, a grandchild’s hugs and kisses and more and more bring out the tears. An amusing aspect is that the surviving WWII folk are in their late 70s into their 90s. Those men cry. I’ve seen and heard it. Oddly enough, many of their boomer kids and grandkids are very forgiving and understanding, we’d have to say more realistic and mature. They simply don’t buy into that unrealistic fantasy of manhood precluding tears. The older you get, the more you have powerful libraries of experience. You also have changing and even rogue hormones rushing in when you don’t expect it. The control the so-called Greatest Generation claims to have had erodes under the constant lapping of life’s tides. We can look back to 1972 to Sen. Ed Muskie crying on TV as he spoke into mics. That was end end of his presidential chances. He was defending his wife against outrageous slander of her as a swearing drunk. Yet, even as he spoke in New Hampshire cold, he later claimed he wasn’t crying, rather those were snowflakes, not tears. We can be sure that Boehner would not be reduced to such ploys. This is another century, a couple of generations out. Honest emotion is out there and Boehner is in its vanguard. Sure, he’s a silly guy, but more for his crazy politics and pandering to wingers than his handkerchief wetting. He may not give a good name to weepy pols. In fact, we could likely do without the melodrama. Yet, here’s a very powerful guy, a certified male of the species who cries in public. That really isn’t so bad now, is it? Cross-post note: This appears also at Marry in Massachusetts. This long, level course through the wetlands of the Neponset River is nearly a straight line, terminating at Interstate Highway 95. Easy terrain but a lengthy route. Great for endurance-building and diagonal stride practice. Start behind the bulletin board and follow the trail to the beginning of Burma Road. Ski to the end, at Interstate 95, and return. Indeed it is very flat. It also runs through what must be marsh and meadow on each side, planted with trees. We kept waiting for the hills, as we are used to in the reservation. It has the feeling of the Cape Code Rail Trail instead. Yet, it was a workout by its length. We also got to play a bit of Holmes too. One skier had been through before us today, followed by a hiker with a dog. The latter pair was clumsy and messy. For the first mile of the trail, they tromped and excreted on the ski tracks (an unfavorite of mine). The dog was prolific, wet and dry, gold and brown. The skier was more intriguing though. The tracks were close together and shallow, suggesting someone slender with narrow hips and light, perhaps 100 pounds or less. The pole basket holes were not far from the tracks and close together, suggesting that she had narrow shoulders and likely short arms. We appreciated that she had blazed the trail, so to speak. After the first mile the booted one and canine companion headed off and back, leaving a decent track for us. On the way back, our tracks made the route even faster. I’ll do that again. Also, while it’s not on Ranger Tom’s Suggested Hikes, I’m sure we’ll try it in the warm. If it isn’t too marshy and buggy, it should be a fine adventure and nature gawk. You are currently browsing the Harrumph! 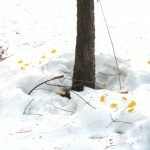 blog archives for February, 2011.